36th Reinforcements C Company Canterbury Infantry Regt. George's last employer was as a labourer for Meredith & Co Waimate. He was medically boarded in Timaru and described as weight 147 lbs, height 5 foot 8 1/2 inches, chest 34 inches, complexion fair, eyes blue and hair brown. He was wearing dentures and his feet were inclined to be flat but seemed to give no trouble. He had had previous service with the 2nd SC Regiment as a Territorial. He served in New Zealand from 12 November 1917 to 22 April 1918 and overseas 23 April 1918 until his death 23 October 1918. He arrived in Suez 31 May 1918 and embarked on the "Ormonde" 4 July 1918 for Southampton and left the United Kingdom for France on 30 September 1918. 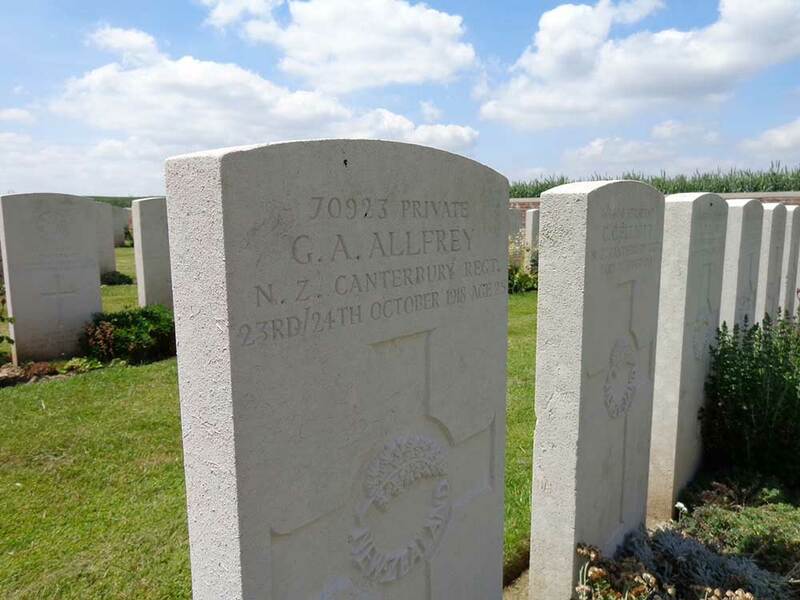 Despite his previous military service Lillian Hall, Allfrey's first cousin twice removed, recounted that: "... he did not want to go to war, he was prised from his mother at Waimate train station and put on board the train, he said he would not be returning home." George died of gunshot wounds on 23 Oct 1918 after less than one month in France (Cas List no 995/8). He was originally buried at Bon A Pierres in an isolated grave 2 3/4 miles SW of Le Quesnoy by Rev G.T. Robson and later reburied in Romeries Cemetery. George's war medals, scroll and plaque were sent to his mother, Mrs J.C. Allfrey, Mary Street, Waimate.